Capital markets, still somehow driven by human emotion despite all the automation of the last decade, typically have real trouble taking this advice. Everything from presidential tweets to a twitchy yield curve causes a cringe even when the blow never lands. The ratio of “Frightened” to “hurt” is large indeed. The CBOE VIX has fallen from 18.2 (March 20) to 16.9 (April 20) and dipped further today to 16.3. The S&P 500 is actually lower over the period by 1.7%. If it weren’t for Energy stocks catching a bid (up 10% on the month) on rising commodity prices, the damage would be worse. The S&P 600 Small Cap Index is basically unchanged over the last month, as is the Russell 2000. This disconnect between declining “Fear” as exemplified by the VIX and moribund stock prices is worth exploring, because risk assets rarely follow the Stoic ideal so closely. Over the last decade we’ve taken a monthly look at the “VIX of” everything from Energy stocks to small caps and precious metals, so we’ve developed a feel for when things are normal and when they aren’t. This month falls in the latter camp. The mechanism for this analysis comes from the US listed exchange traded funds that track these industries and asset classes. Where there’s an ETF, there’s often a listed option chain. Track the implied volatility of those options, and you have a useful VIX-like measurement of anticipated future risk. Or, you can just call it the “Fear Gauge” of everything, to borrow from the VIX’s nickname. Only two groups show declining VIX-style readings over the last month: Real Estate (-6.7%) and Utilities (-4.5%). We ascribe that to options traders relaxing their concerns about rapidly rising interest rates. Both groups are down badly on the year (4 to 8%), and likely have a tough path forward. The move in volatility pricing now signals a slow grind lower rather than a short sharp shock for these two sectors. A “Dead cat bounce” is also very possible. Five groups show dramatically increasing “VIX” levels over the past month: Financials (+5.6%), Energy (+6.1%), Consumer Staples (+9.2%), Consumer Discretionary (+9.5%) and Tech (+11.6%). Excluding Energy, all these groups are lower for the month. How then is the overall VIX modestly lower this month, if 65% of the S&P 500 saw higher levels of implied volatility over the same period? Three reasons. First, the VIX has been a bit wonky since its February spike. Second, it is difficult to arbitrage sector “VIX” to the actual VIX so imbalances can and do occur. Lastly, correlations have declined modestly in the last 30 days so the overall volatility of the S&P 500 is not as closely tied to individual sector performance. The “VIX” of small cap US equities rose modestly over the past month (+2.4%). This piece of the domestic stock market has performed much better than large caps year to date, rising 2.9% versus a 0.11% decline for the S&P 500. A modest increase in the cost of insuring a small cap portfolio (another way to think about what VIX really represents) seems like a logical extension of that performance. The “VIX” of mid cap US stocks actually fell by 3.7% over the last month. Unlike small caps, this bit of US equity markets is barely up on the year (+0.11%). It should, perhaps, play some catch-up to small caps and therefore options traders are modestly re-pricing risk here. The “VIXs” of gold and silver are both higher this month by 9% and 10% respectively despite reasonably good performance (+1.4% and +4.8%). We chalk this up to recent strength in the dollar, which tends to hurt gold prices and traders’ confidence in any further advance. Both developed (Europe, Asia, Far East) and emerging economy equities saw notable declines in their “VIX” readings (4% and 25%, respectively). This is most likely another part of the reset we mentioned in the section about S&P 500 volatility. You never know how out of kilter a market gets until things settle down again. Corporate bond “VIX” levels tell an interesting story about investor risk appetites. 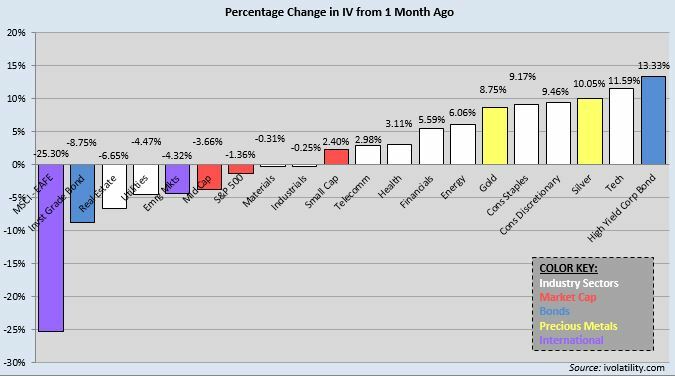 High yield “VIX” rose 13% last month, the most of any asset class or sector we track. Investment grade corporate bond “VIX” fell by 8.8%, one of the steepest declines. Easy to tell this story: fixed income investors are increasingly worried about sub-investment grade corporate debt in a world of rising interest rates, lofty valuations and late-cycle fundamentals. #1. To the degree you use the VIX as a measure of market “Fear”, realize that this measure has been off its game over the last weeks. The storm of volatility in February decoupled it from underlying fundamentals and it is only now reset to something closer to reality. #2. The sector “VIX” readings tell an important story: there is much less complacency in US equity markets than the drop in the VIX would signal. That is a healthy sign, and actually positive for the near term direction of domestic stocks. #3. As far as sector bets, the “VIX” data points to US large cap Technology as one place to look for a near term bounce. The group saw the largest increase in industry-specific “Fear” over the last month. Just as an elevated CBOE VIX Index can point to a buying opportunity for the S&P 500, this measure highlights the opportunity in Tech.